Comparing Tents: How Do I Choose What Tent to Buy? I'm a first time serious tent buyer, I feel like I'm buying a car! I've been backpacking a few times, week-long trips, so i understand the importance of quality in a tent. The 2 person tents I'm looking at are all Marmotsâ€¦ specifically, the Limelight, Aura, and Aeolos. The 3 person tents I'm looking at are the Limelight again and the Marmot Boreas. I had been looking at the North Face Big Fat Frog for a long time, but I think I'll get my money's worth more from one of these Marmots. I also checked out some MSR tents and others but didn't find designs (or prices) as appealing as the Marmots. Can you offer any advice on specific differences between these tents, especially the Aura and Aeolos? I would check them out myself, but there isn't a place in my city that has these high quality tents. Thanks for your question about comparing camping tents! And thank you for making my job so easy! I'm pretty opinionated when it comes to camping gear, especially what I consider to be the best quality tents. And you've done half the work for me by narrowing down your list to Marmot tents (check out our review of Marmot here!) which happen to be some of the absolute best in the business! And not only that, but you've narrowed it down even further to a few of what I consider to be the best models in the catalogue. It can be hard to make a final decision on a camping tent because, as you say, it's a big investment. Your new tent should stand tall through harsh weather, keep you warm on cool nights, keep you cool on warm ones, and be easy to pitch. There's a lot that goes into choosing the right structure. It's not a decision to take lightly, and I'm glad that you agree! Okay, so let's get down to it. You've got three, 2-person tents here and 2 3-person ones you're serious about. It's time to lay out the pros and cons and make a final, educated decision. The models you listed above are the Aura, the Limelight, and the Aeolos. Each of these tents is a fine structure that will treat you well in the wilderness, but they all have their own unique advantages and drawbacks. The Marmot Aeolos is a high quality tent in terms of portability and ease of use. The poles of the Aeolos are DAC NSL Dual Diameter Green Poles, which just happen to be 15% lighter than most aluminum models. This makes hiking into the backcountry a breeze and allows you to carry some extra equipment without feeling the weight, assuming you have the extra space. With 35 square feet of interior acreage, it's also an incredibly roomy 2-person tent, with enough space to actually house two campers comfortably. And the bare-bones set-up is a snap. The main drawback of the Aeolos is its lack of availability. You can still find it on Amazon, but it's pretty difficult to find otherwise. You can find it anywhere, which makes locating a great deal or sale all the easier. It has a decent peak height of 41", a 9-square-foot vestibule, 30+ square feet of interior room, and a packed weight of 4 pounds, 10 ounces, making it one of the lightest models on the Marmot shelves. On the downside, the Limelight features just one door and vestibule, making it a little inconvenient for multiple campers. My pick of the three is the Marmot Aura. 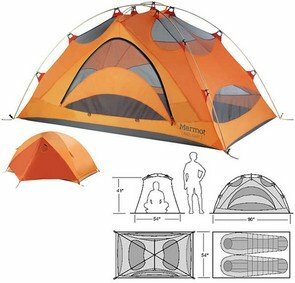 If you're looking for the best of the best in 2-person tents, you simply cannot go wrong with the Marmot Aura. It's a wise and rewarding investment. The good news is that two of the 3 person tents you've chosen--the Limelight and the Boreas--are fantastic tents worth your money. The bad news is that you can only pick one! They both have great features. They're roomy, offer two doors and vestibules, are made from ultra-lightweight materials, can withstand Mother Nature's inevitable wrath, and will last you for many happy years. But they have their differences, too. 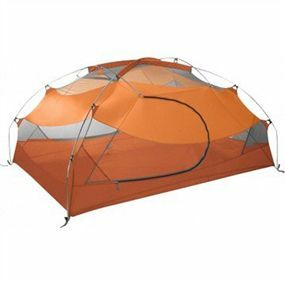 The Boreas is about $50 more expensive than the Limelight, but offers a lighter packed weight, double-wall canopy, and mesh walls that are great in the warmer months. The Limelight, however, is cheaper, has a taller peak height, a bit more interior space, and mesh windows for fine ventilation. Picking just one is a fairly subjective task. You have to go with what stirs your excitement. I, for one, get a bigger smile on my face over the Limelight. It's less expensive and offers more room than the Boreas: two major selling points, in my humble opinion. So, if you follow my advice, it comes down to the Aura 2P and the Limelight 3P. The answer, of course, is entirely up to you. It all depends on what your camping style is. Do you plan on camping alone? Do you camp with one other person? How about two other people? Are you not yet sure? If there's a chance you'll be hiking mostly with one or two others, I'd go for the Limelight 3-Person tent for the comfortable living space. If you mostly plan on sleeping out alone, then the 2-Person will do you just fine with its lower price and lighter load. Comments for Comparing Tents: How Do I Choose What Tent to Buy?